2.3" x 2.3" stitched on 14 count. 1.8" x 1.8" stitched on 18 count. 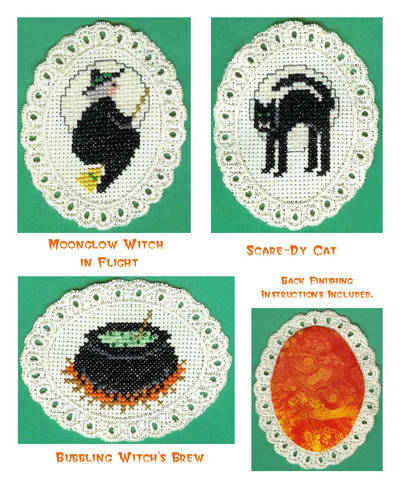 Howl-O-Ween Trio cross stitch pattern... 3 charts - witch, black cat, with Glow In The Dark thread; cauldron of Glow In The Dark brew with beads for bubbles and blending filament on flames; say Halloween. Instructions / tips given. May be stitched on fabric. 14 count oval source given.